Getting tired of “The quick brown fox jumps over a lazy dog”? Here are some new pangrams that I wrote recently, in an effort to make my handwriting and calligraphy practice more enjoyable. They use all 26 letters, in various combinations, and I made an effort to make the sentences enjoyable to write over and over again. Some people like funny or nonsensical pangrams, or really short ones, but I found that for me it is helpful to include a few repeated letters to make a sensible, pleasant sentence. Calligraphy experts have ways to make beautiful lettering, with unique shapes, sizes, and colors, just for you. You might enjoy writing some new pangrams too. It’s a bit of a challenge at first, but once you start and get on a roll, composing new pangrams can be addicting! Using a pangram letter frequency counter makes it much easier. What Do You Write When Testing? Do You Have A "test Phrase"? Props for your creativity, and thanks for the links. I'm in awe with your inventiveness! Thank you for sharing. Photo of a calligraphy practice sheet using a pangram as text. We have a written example already, nice! 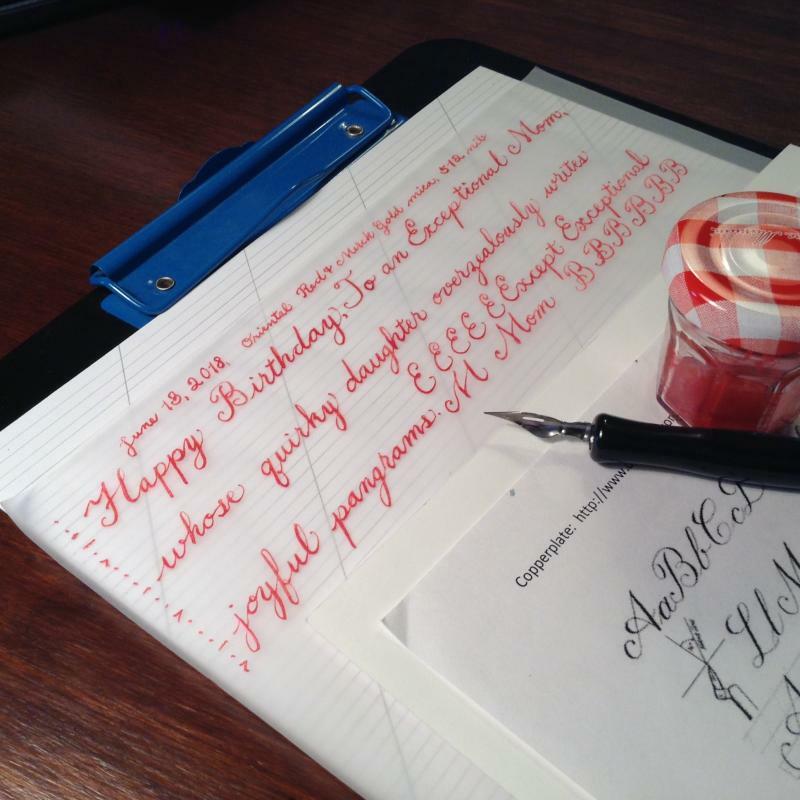 Have you visited the pointed pen calligraphy section yet? And the "learning copperplate" threads? If you want to share your practice there are awesome people there! Edited by RoyalBlueNotebooks, 16 June 2018 - 19:15. Making your own envelopes can uniquely customize the jotted text before mailing. A two quart jug has a sixty-four fl. oz. label marked on every package. A majority of qualified citizens prefer to make doughnuts over bagels with lox. Lapis lazuli, formerly the source of ultramarine pigment, was a gemstone valued for its unique jewel blue sparkle when mixed in paint. Silverpoint portraits and drawings became prized techniques just for tricky execution. Except for the jacket, the black suit made a snazzy example of great weave quality. Fossilized remains from the Jurassic period quantify the extent of known big vertebrates. Lack of materialized subject gains was apparently vexing to HQ. Alphabetical arrangements are jeopardized if luxury widget maker supervisor quits. Every quarter, more new finicky tax filers have subjectively categorized improperly. Marketing execs still rejected the bad advert proposal, with amazing frequency. Inquisitors never knew the full extent of the puzzling objectives of Jimmy and Adam. Jane was forever quoting zinger lines about exalted primary chicks. The person who should be reading this is the one who complained in another thread recently about how everyone always uses "the quick brown fox...."
Thanks for coming up with a bunch of different ones! I thought the same thing for a moment there! And I join Ruth in thanking you for the new pangrams. This is a creative, inspiring thread, great work! I'm so glad you like them. It's nice to feel appreciated.